This is the magic of books: One can never have enough of them. 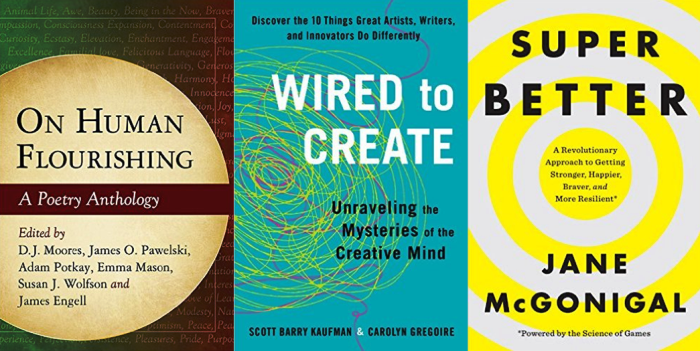 After publishing two lists of recent and upcoming books that are infused by Positive Psychology over the last days (list one, list two) people kept pointing my attention towards more exciting stuff. So here´s another list of three books that you should definitely put on your reading list. This collection of verse brings together poems of felicity, capturing what it means to be well in the fullest sense. Presented in 14 thematic sections, these works offer inspiring readings on wisdom, self-love, ecstasy, growth, righteousness, love and lust, inspiration, oneness with nature, hope, irreverence, awe, the delights of the senses, gratitude and compassion, relation to the sacred, justice, and unity.